Your life is what you think it is. Some people get stressed and worry about nothing; others handle seemingly insurmountable stress and thrive. Which are you? To yourself, you are what you think; to the outside world, you are what you do. Since every single action you take is based on what you are thinking, it is possible to completely turn your life 180 degrees. In this subconscious reprogramming system, you will no longer have to force yourself to change what you do—this program will change who you are! Would you like to be a Master of Influence? 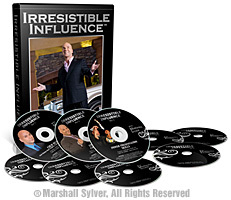 Now you can with Marshall Sylver's brand new Irresistible Influence audio series! ONLY $499.99!!! Influence is the ability to have someone ask you for the thing you are selling... and have them believe it was their idea!" YOU WOULD HAVE WHAT A MILLIONAIRE HAS!!! In this breakthrough program, Marshall will not only teach you what a millionaire thinks, he will program your mind to make those thoughts your own. You will effortlessly take on the mental beliefs, programs, and thoughts of millionaires and billionaires simply by listening to this program. 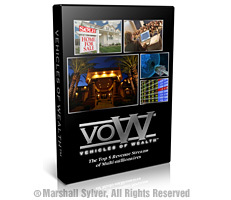 A variety of different wealth vehicles. The power of Massive Passive Income. When you think what someone thinks and you do what someone does, you'll produce the same result. Take your front row seat to see Marshall Sylver, The Millionaire Maker,™ lecture LIVE for two full hours! To become a millionaire one has to learn the disciplines that millionaires have, and furthermore act upon them. What are these discipline, you ask? 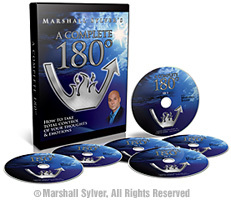 Marshall Sylver has created this powerful DVD program, shot at the beautiful Prosperity Palace, to explain to you just that. In addition, he's listed the top 5 vehicles of wealth for you to sample to get you well on your way to millionaire-status. How to place yourself into a deep subconscious relaxation. The rules of the mind and why you respond the way you do. Information that will change your life forever!!! The structure of successful subconscious suggestions that create rapid habit change. How to write subconscious reprogramming programs so you can produce your own audio recordings on you iPod or computer and save money. immediate action in intelligent ways. The ability to control your beliefs, thoughts, and emotions in the most stressful of circumstances. The basic strategies of irresistible influence. Knowing in any moment the highest and best use of your time. How to expand what you believe is possible so you will confidently take fearless action. 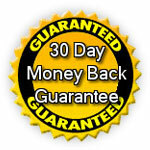 How to create massive passive income. 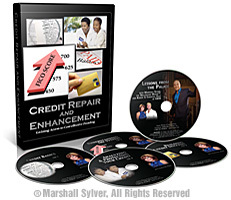 Marshall Sylver has teamed up with Attorney J.J. Childers to provide you with this powerful new program. This program gives you the answers to the who, what, where, when, why, and how questions teaching you to implement the various wealth tools of the affluent. Special emphasis is placed on the mechanics of the various entities including much needed information on how to actually conduct your business and everyday affairs through the use of legal entities. How to operate a limited partnership for business or investments. How to utilize Charitable Remainder Trust to reduce your taxes while giving to charity. How your entities can reduce your taxable income. 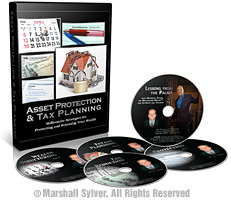 Reduce, or even eliminate your estate taxes. Move your existing assets into legal entities. Lowering your tax braket through your entities. How a trust can provide continuity for your assets. How millionaires can have a taxable estate near zero. How to use your corporation to own interest in other entities. 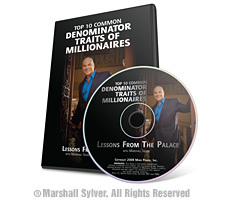 Also included is a BONUS DVD where Marshall Sylver interviews J.J. Childers for a new edition of Lessons from the Palace! 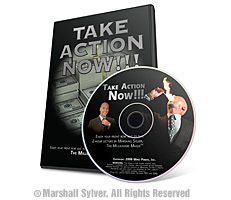 Marshall Sylver has teamed up with CMAC's Robert and Christina Hunt to provide you with this powerful new program. CMAC (Credit Mentoring & Consulting, Inc.) was founded as an effort to provide consumers a personalized resource for their credit concerns, questions, and challenges by providing access and support. Also included is a BONUS DVD where Marshall Sylver interview Robert and Christina Hunt for a new edition of Lessons from the Palace! Surrender & Find Your Life Perfect! Imagine using the tools, strategies and communication techniques of Politicians, Superstar Sales People, and other Professional Persuaders. Now you can use their techniques quickly & easily with this cutting edge program. 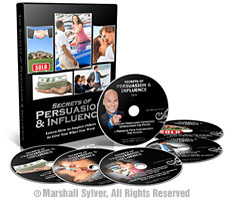 Whether you are persuading someone to get involved with your prodct or serviceu, or influencing someone to accept your concepts or ideas, you will learn the incredible secrets of subconscious persuasion with this system. 6 CD's: These cd's are specifically designed to both teach and program you on a subconscious level to use the information easily and readily. 1 full length workbook: This workbook contains sample scripts that will jet start your sales and help you create charismatically magnetic presentations. The workbook gives you fast reference to keep you sharp and allow you to reinforce these tools and techniques quickly. In this video, you will gain the powerful skills of how to influence the subconscious minds of other people. 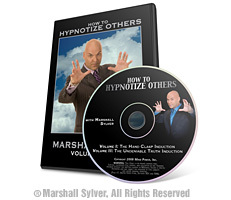 Whether you want to make hypnosis a profession, you want to help those you love change unwanted habits, or if you are just curious about his age-old process, Marshall Sylver will teach you everything you want to know on this training video. 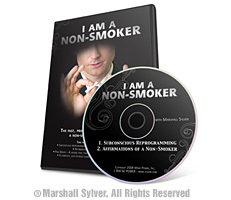 A subconscious reprogramming CD to help you remove the desire to smoke. Affirmations to remain a Non-Smoker. smoking from a habit to a choice. A complete easy-to-read guide for effectively becoming a Non-Smoker. subconscious mind to become a Non-Smoker! Kick the Habit in JUST 7 DAYS!! I felt this strength and firm resolution to stay a Non-Smoker forever. Thank you, Marshall!" Fat Loss Wristband - A unique tool that makes eating a choice not a habit. #1 Create the mental, physical, and emotional habits of a slender person. #2 Reprogram your mind to psychosomatically (psycho - the mind, soma - the body), make the food you eat either energy or waste products. THIS FAT LOSS KIT WILL DO BOTH! 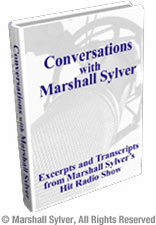 A special 6 audio CD collection of some of the best calls recorded from Marshall's hit radio show. Listen-in on lessons taught to real people in every day situations, such as dealing with addictions, skills for making massive wealth, relationship building, overcoming fears, and many, many more with Marshall Sylver! Each audio CD also comes with a complete printed transcript of all of the calls so you can read as well as listen. This new item specially priced for a limited time only! The power of suggestion. And much, MUCH more. 1 workbook with over 150 show routine ideas, sample inductions and more! 1 CD-ROM containing software to run your show, printable induction Scripts, royalty free sound effects and more! 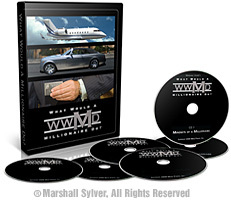 NOTE: This package also includes a personally autographed 8 x 10 photo of Marshall Sylver. Where Silver is truly more precious than gold! 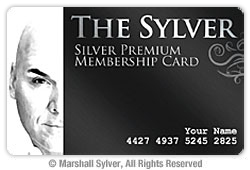 With this membership card you will become a Sylver VIP! Upgrade from VHS to DVD today!!! 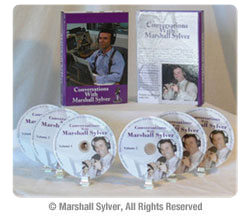 We are happy to announce that all Marshall Sylver products are now available on CD & DVD ONLY! Click here for upgrade details!